Gas fireplaces don’t put out the same amount of heat as wood-burning fireplaces, but are more efficient because significantly less heat is lost through the vent. Wood fireplaces generate more heat, but are less efficient than gas fireplaces because a lot of the heat is lost up the chimney. 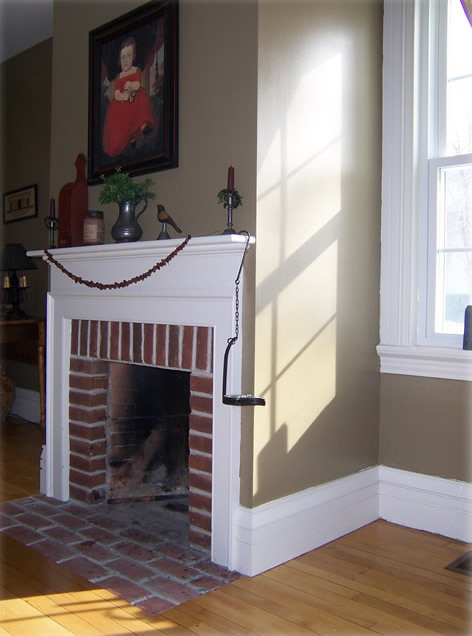 Instead of a chimney, a gas fireplace requires a direct vent, which leads through the wall near the fireplace. Direct vents are easy and inexpensive to install. Wood fireplaces require a chimney, which is more expensive to build and often necessitates structural changes to the floors, ceilings, and roof of the home. A gas fireplace weighs about 75 lbs, so it can sit on any floor surface. This means you don’t have to reinforce the structure of the home to install one. Wood fireplaces are constructed with heavy masonry. This means that the structural support of a foundation will be needed. 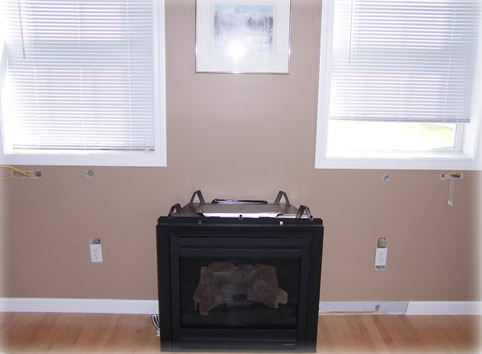 Gas fireplaces are often considered less aesthetically appealing than wood fireplaces. Wood fireplaces have an aesthetic appeal and/or nostalgic value for many. As long as they are installed correctly, there are no health concerns associated with gas fireplaces. There are some health concerns associated with wood fireplaces. Due to atmospheric pressure, drafts sometimes force small amounts of smoke into the house, which can bother sensitive lungs. Installation of a wood vs. gas fireplace. If you’ve spent time around a campfire or by the family fireplace, you have experienced the mesmerizing power of flickering light and crackling wood. The calming effects of an open flame have been recognized throughout history, and Windsor resident Kim Scalese, a lover of all things old, wanted to welcome the tranquility and warmth of fire into her 17th-century home, without disrupting the antique feel of the structure. Kim wasn’t sure what the fireplace should look like, so she chose from Peachtree Builders' list of interior and exterior chimney options. 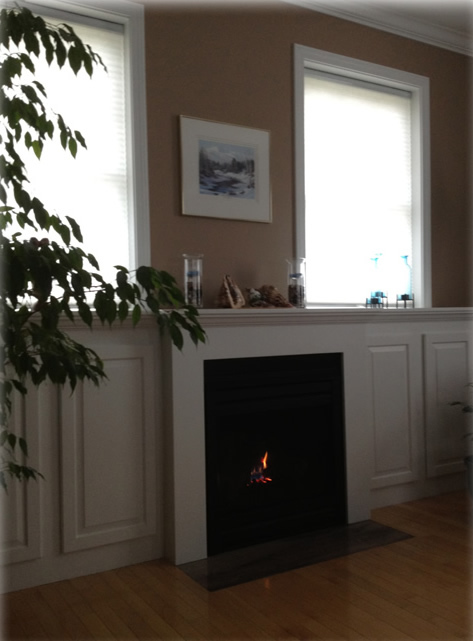 Peachtree then created a plan that would comfortably fit the fireplace in the small space where Kim needed it placed. Kim reviewed a number of different molding options and settled on a trim that matched her current molding perfectly. For a wood fireplace you need a good foundation to build it on to support the weight of the entire structure including the chimney. 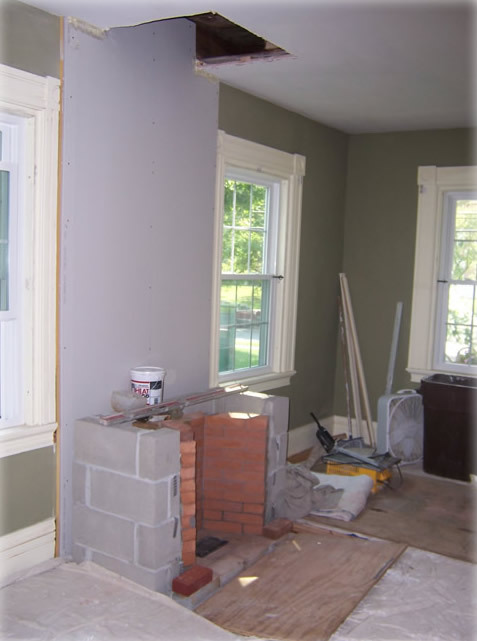 Since working with masonry can produce a lot of dust, Peachtree Builders covered her furniture while they worked and used a fan to keep the area dust free. 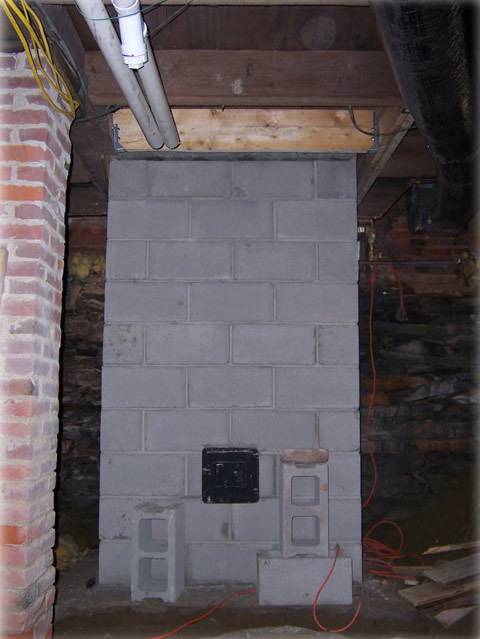 The weight of the masonry chimney required a foundation, which Peachtree Builders poured. They then cut through each level of the house, all the way up through the roof, where the chimney would reach through. Next the structure is constructed by hand using noncombustible materials. In this case cinder block and brick are used. 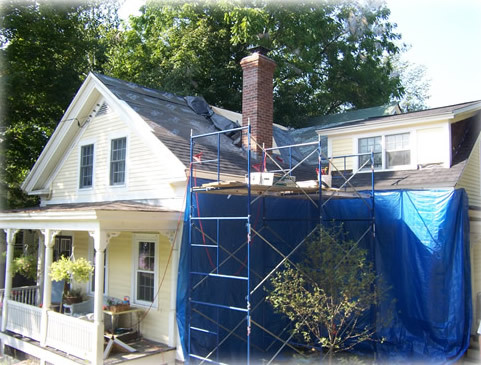 The exterior of the home needs to be protected from the time the roof has been penetrated until the chimney is completed and the roof is sealed. Once the basic fireplace is completed it needs can be finished. There are many ways to do this, traditionally a mantel with surrounding trim makes it the focal point of the space. Installation of a gas fireplace requires less disruption of the home, and no support foundation. After the wall behind the unit is roughed in for electrical, and the vent is placed through the wall to the outside, it is ready to install. No additional support or new chimney is needed. Once the unit is in place the focus in now on the cabinetwork and trim to make it the centerpiece of the room. With a little imagination it can be a stunning presentation. We have used Peachtree Builders for a number of projects in the past, and last year we made the decision to add a built in gas fireplace to our living room. We have had such positive experiences with Peachtree we did not even considered using another contractor for this enhancement. We started the process by selecting the fireplace we felt we wanted, and then contacted Richard to discuss options. Not knowing exactly what kind of enclosure we wanted, we relied on Richard to walk us through options available and get his thoughts on the most appropriate option to fit our living room. He came back with a number of proposals and pictures that we were able to refine and design the perfect fit for our room. The creation of the built-in and its installation were handled perfectly, with Richard coordinating everything from the connection of the gas line to the installation of the fireplace in the enclosure he built. It has been a great addition to our home.